The SR625 Frequency Counter is a NIST traceable frequency counting standard for calibarating base stations, transmitters and many other types of communication systems. It combines the high resolution and wide variety of features found in the SR620 counter with the atomic accuracy of a rubidium timebase. The SR625 Frequency Counter consists of a frequency counter (SR620), a high-accuracy rubidium timebase (PRS10), and a 2 GHz input prescaler. The combination of the SR620 and the prescaler allows direct frequency measurements up to 2 GHz with twelve digits of resolution in a 100 s measurement. The rubidium timebase ensures excellent short-term stablity (<2 ´ 10-11 Allan variance (1 s)) and long-term drift (<5 ´ 10-11/month). The SR625 warmup time is less than ten minutes making it ideal for field applications. 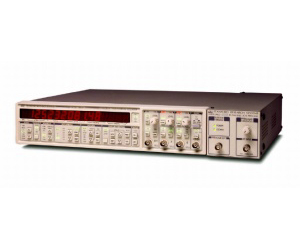 An additional back-panel output provides a rubidium stablized 10 MHz signal which can be used to drive other test equipment (e.g., synthesizers or spectrum analyzers). The standard GPIB and RS-232 interfaces allow for complete control and data acquisition from any laboratory computer. The performance of the SR625 makes it the standard for remote applications or laboratory calibration.